Today I decided to stamp a non-Christmas card - a Thank You card. The reason...as some of you know my position at work was eliminated back in June. I worked at this company for 23 years and was devastated, needless to say. I took the summer off to spend it with my twin girls before they went off to college this year. Well, now they are in college and I've begun the process to find a job. This past Monday I attended a meeting/support group called "Unemployed Professionals" and learned from the guest speaker that after an interview you should send a handwritten Thank You note to the person who interviewed you. Rarely does anyone do this anymore and it could make you stand out from all the other applicants. So what better way to REALLY standout - send a handmade Thank You card! Not that I have any interviews lined up yet, but it never hurts to be prepared...right? Back to the card...I first stamped the "heartfelt" with VersaMark ink and then used White Embossing Powder. Once I heat set the "heartfelt", I then used the flower outline stamp and VersaMark to randomly stamp on the Pink Passion card stock to give the watermark look. I also stamped the "thanks" stamp with VersaMark in the inside and embossed with white embossing powder. A very quick and easy card! Yesterday I was suppose to be cleaning my house, but I got this mini-snowman paper lantern stuck in my head and I just had to make him. He measures 6 1/2" tall (from the hat to the bottom) - isn't he stinkin' cute! Needless to say the house did not get cleaned! It occurred to me that the original Snowman Paper Lantern I made was too big to hang as an ornament on my Christmas tree, and that I could make him smaller. The only thing is the hat was just too time consuming to make and with a much smaller snowman it would be much harder to make. Of course I was thinking about all this on my way into town to drop off my daughter at college. So I stopped at a local craft store to see if they had any snowman hats...and THEY DID! Yeah!!! Bottom Snowball = 16 strips - 1/2" x 4 1/4"
Middle Snowball = 12 strips - 1/2" x 3 1/2"
Top Snowball = 10 strips - 1/2" x 3"
I just used markers to draw the face and buttons. I used the paper piercing tool to make holes for some twigs I found in my yard. You'll need to use E6000 to glue the twigs into the holes. I used 3/8" Real Red Grosgrain ribbon for the scarf and the 1" tall hat is made by Nicole. I hope you enjoy my mini-snowman as much as I do! Thanks for stopping by! This weekend I finally got a chance to work on some projects! I made these cute origami boxes from a square sheet of retired Designer Series paper. These were so much fun to make and then decorating the belly bands is where you get to be really creative. I was going to make a top for the box, but then decided it just wasn't practical to take the top off for a piece of memo paper. I needed a way to keep the paper in the box, so I decided on a belly band. The memo cubes I used were 3 1/2" square. You'll need a 10 1/4" square piece of paper or cardstock (I used a 12 x 12 sheet of paper and trimmed it. Click here for the directions. For the belly band I used the 12" long strip of the double sided paper I had trimmed away. I wrapped it around the box and paper and adhered the overlapping pieces to each other. 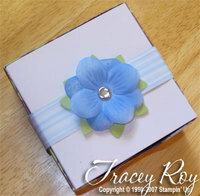 For the flower on the brown box I used 2 flowers from the Pretties kit and inked them with Bashful Blue Classic Ink. 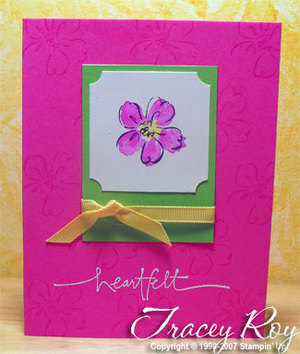 I used the 5 Petal Punch and punched 4 flowers out of Certainly Celery cardstock to make the leaves behind the flower. I used my Crop-a-Dile and punch a whole in one of the petals near the center (on all 4 flowers) - this allowed me make the leaves stick out beyond the Pretties flower. Then I used one of the Rhinestone Brads from the Pretties Kit to attach everything to the belly band. 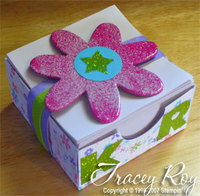 For the flowered memo cube I used a flower from the On Board Accents and painted it with Pink Passion Craft Ink. You can use the heat gun to speed up the drying - which is what I did. Then I used my VersaMark ink pad and inked the whole flower and embossed with Glassy Glaze Enamel (which evidentially someone accidentally put white embossing powder into, but it gave the flower a funky look that I was fine with. Note to self...order Glassy Glaze!) This memo cube was going with my daughter back to college. She loves lime green, so I had this flashy green alphabet stickers that matched, so we put her initials on the front of the cube and used a star sticker in the center of the Tempting Turquoise circle on the flower. Here are some top views of the boxes so you can see the embellishments on the belly bands better. 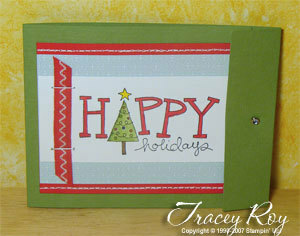 Today I used the card kit from the Holiday Glitz promotion. The kits comes with instructions for 4 different cards that can be created from the kit. I used a variation of 2 of the samples and then did a little bit of my own thing. 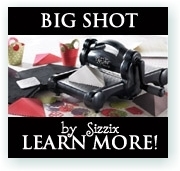 I just needed the inspiration to get stampin'! First I took the precut 2" x 4.25" piece of Whisper White card stock and stamped "Happy Holidays" from the Big on Christmas stamp set using Jet Black Stazon ink. Then I used my Marvelous Markers and colored the work "Happy" with Real Red. I colored the tree with both Garden Green and Certainly Celery to get a watercolor effect. First I colored the left edge of the tree with a little bit of the Garden Green and then I used the Certainly Celery and colored the rest of the tree blending the Garden Green into the Certainly Celery and wiping some of the Garden Green off onto a paper towel. I used Yoyo Yellow for the star and just used a few other colors for the lights on the trees. For the tree trunk I used Close to Cocoa. I layered this onto the precut 3" x 4.25" piece of Soft Sky Designer Series paper. Then I layered onto a piece of precut 3.5" x 4.25" Real Red Textured card stock. I used the paper piercing template and tool on the edges of the Real Red along with the White Gel pen to get the sewing look. I layered this onto the precut 11" x 4.25" Wild Wasabi Textured card stock and stapled the Real Red zigzag ribbon onto the card. The Wild Wasabi card stock comes prescored for the matchbook style card. To keep the flap of the matchbook card closed I used my Crop-a-Dile and punched a 1/8" whole and inserted the Light Blue Circle Rhinestone brad. It's a pretty easy card to make especially since everything came precut! Today's card is one that I CASEd from my up-line Ruth - she makes the most beautiful and elegant cards! 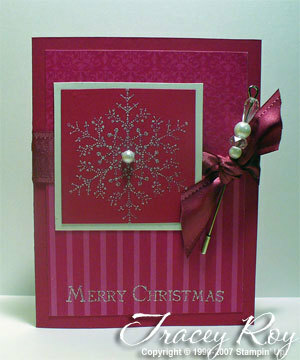 This card uses the Dashing Designer Series Paper - another great reason to take advantage of SU! 's special this month (buy 3 pkgs of DS and get 1 free). 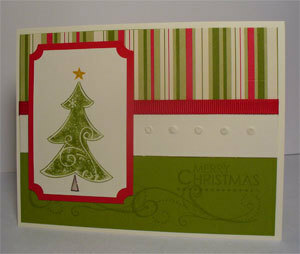 I used Very Vanilla card stock for the card and also used a 1" strip of it across the center of the card. I dry embossed the raised dots using the Crop-a-dile and the paper piercing template (this helps you line-up the raised dots perfectly)...be careful not to press to hard or you will make a hole in your card stock. I layered the DS paper and the strip of Very Vanilla onto a piece of Old Olive card stock. Then I stamped the swirls and Merry Christmas from the Season of Joy stamp set onto the Old Olive card stock with Old Olive ink. I also used a piece of Real Red 1/4" Grosgrain ribbon above the strip of Very Vanilla. I inked up the Tree stamp with Old Olive ink and then used Q-tips to remove the ink from the star and trunk of the tree. I used my Marvelous Markers and colored the trunk with Chocolate Chip and the star with Summer Sun and then stamped the image onto a 2 x 3 piece of Very Vanilla card stock. I used the Ticket Corner punch on all the corners and layered onto a 2.25 x 3.25 piece of Real Red card stock which I also used the Ticket Corner punch on. That's it the card is done! But wait...I wanted to add some sparkle and shine to the card so I used my clear Spica glitter pen (non SU!...I know how dare I use a non SU! 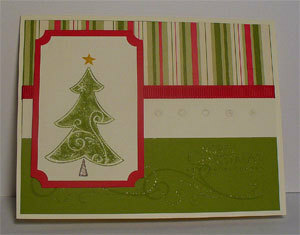 product) and traced the dots of the swirl stamp as well as the Merry Christmas, the tree trunk and the star. You can't see the sparkle in the above picture, but you can see some of it in this picture (below). Thanks for stopping by! Edited 11/6/07: I've had so many emails requesting directions for the snowman hat, I decided to edit the post and add the directions. But somehow the post ended up changing to today's date and the old one is now gone. UGH! Sorry for any confusion this may cause. I also have had several request for the measurements on the gatefold card...now I don't dare edit that post! I have had so many wonderful comments about my paper pumpkins that I thought it was time to finally take the snowman idea from my head and make it! 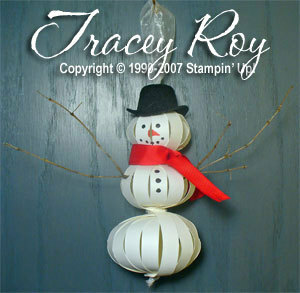 I did see a snowman similar to this in the SplitCoastStampers Gallery, but it didn't have a face on it. Today I was checking out a blog that had linked to the Paper Pumpkins on my blog and I saw a snowman similar to this, but made from the SU! 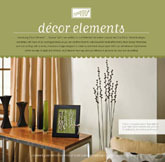 Wintergreen designer series papers. So, I guess I wasn't the only one who thought of this idea after seeing the pumpkin lanterns at convention. I used Whisper White card stock. The bottom snowball is 16 strips - 8.5" x 1". The middle snowball is 12 strips - 6" x 3/4". The head is 9 strips - 5" x 3/4". 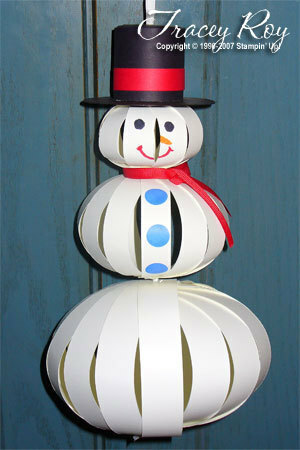 (See the Paper Pumpkins post for more detailed instructions on how to make the snowballs.) I stamped circles in Brilliant Blue on one of the middle strips. For the face I just used Marvelous Markers and drew a face. The hat is made from Basic Black card stock. I used the Coluzzle Circle to cut the rim & top of the hat and then cut a 1 3/4" x 6" strip for the band of the hat. It was a little tricky making the hat. If you want additional instructions for the hat leave me a comment or email me. I used a 1/2" strip of Real Red card stock to put around the band of the hat. For the scarf I used some retired 1/4" Red Grosgrain ribbon - I thought I had ordered the 5/8" Real Red Grosgrain ribbon in my last order, but I guess I didn't! Next order for sure! I hope everyone likes this snowman as much as they liked the pumpkins! Enjoy! Cut a strip of black card stock 6 ½” long x 1 ¾” wide – form into a circle and adhere with sticky strip. Cut a strip of red card stock 7” long x 1/2” wide or use ribbon. Using the circle Coluzzle cut on the 4th slot in from the inside. Punch a hole in the middle of the circle for the ribbon to go through. Then miter the outside edge of the circle in ¼”. Adhere to mitered edge to the inside of the hat band. 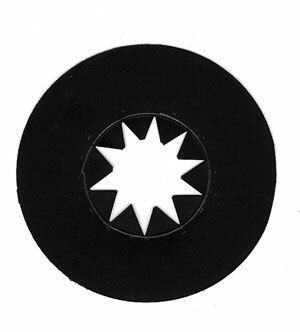 Using the circle Coluzzle cut on the 3rd slot in from the outside – do not remove the Coluzzle yet. Then cut the inside circle on the first slot in the inside of the Coluzzle. Now you can remove the Coluzzle. Draw a circle ½ inch in from the inside circle (I used a salt shaker to trace around). To view the Scrapblog Album above just click on the big arrow in the middle of the box and then click on the Play Slide Show button at the top. Then just sit back, relax and listen to some piano music as the 18 pages of my album automatically change for you to enjoy. Notice on pages 8 and 9 I have created a little graduated flip book to hold lots of pictures. 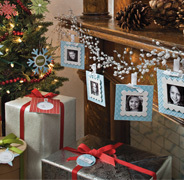 This is a great way to get a lot of pictures on to one page without cluttering up the page. I did add some additional 12 x 12 cardstock for more pages and also used some 8.5 x 11 cardstock to layer pictures on and to make the graduated flip books. I have not done journaling on any of the pages. I am giving this album as a gift to my friend and I am thinking it would be better for her to do the journaling. What are your thoughts, should I journal or let her journal? Click on the comment button below and let me know what you think. Thanks! I know I said I would post a photo album with my Scrapbook in an Evening pages, but the pictures I took of the pages did not come out that good, so I had to retake them (which I did last night). Now I just need to get the pictures cropped and into the album so I can post. It's on my to do list today! Hopefully I will get to it and have it posted tomorrow. Meanwhile I wanted to post this beautiful card that I totally CASEd from The Stamp Doc. I just love this card! For me it's the Purely Pomegranate color - it's my favorite color! I also wanted to post this card today Nov. 1st because Stampin' Up! 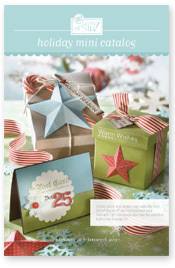 is having a special this month on all the Designer Series Double-sided papers. Purchase any three Designer Series Papers and get the fourth one ($9.95 value!) FREE! No limits, no restrictions. 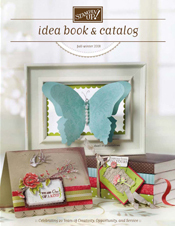 For more information about this special and some free project downloads visit Paper Party Promotion. Email me if you would like to take advantage of this offer.